Happy New Year everyone! It’s days into 2019 and it’s time to reflect on the incredible year we left behind. We enjoyed some amazing highs and quite a few ‘pinch me’ moments but above all we are very grateful and deeply honoured to serve all our amazing clients who trusted us to create their luxury wedding cakes and celebration cakes. 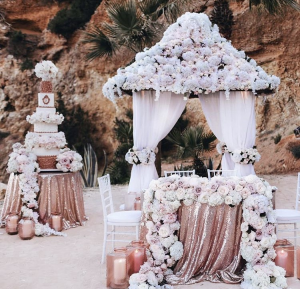 At Elizabeth’s Cake Emporium, we pride ourselves on delivering some of the best wedding and celebration cakes for our most cherished clients to locations across the globe. Below are some of our few snapshot moments and highlights of 2018. The year got off to an incredible start when we were asked by world renowned celebrity florist Karen Tran to help plan her London masterclass and royal gala dinner for early Spring. The only venue we thought had the right grandeur and ambience for the event was The Lanesborough in Hyde Park. We also asked one of our favourite wedding planners, multi award winning Jane Riddell of Planned for Perfection to work with us and with WildAbout, one of the most celebrated florists in the UK, we put on what was arguably the industry’s event of the year. The event received incredible press and we are very grateful to all our partners who worked so hard and brought their A game to the culminating gala dinner. The next stop in our luxury wedding cake adventure was a private beach in Ibiza, The Amante Beach Club. The bride absolutely loves opulence and wanted a really huge cake for her wedding on the beach. We got to work with the utterly amazing and very helpful Paula Rooney Flowers which is always a bonus. Although we were warned that the venue was up a cliff, the sight of the cake being carried up such a steep face is one I will never forget! In between the record number of luxury wedding cakes we made this summer, we made some rather awesome luxury celebration cakes too. We were lucky to make this Chanel themed luxury dessert table for the most beautiful 16 year old who wanted an intimate sophisticated lunch with her friends. For this lush cakescape we created a number of cakes including two macaron towers, black and white cakes with the Chanel logo, cupcakes, cookies, cakesicles and the cutest chocolate perfume bottles. We got to work with our dear friends from WildAbout and Plume Design UK to create a beautiful setting in the wood panelled room St George’s room at The Lanesborough. We were back again at The Lanesborough Hyde Park for the most special of events. Event Imagineer, Tony Marklew, designed the most impressive floral wonderland we have ever seen and at Elizabeth’s Cake Emporium and we have certainly seen quite a few floral designs in our time! 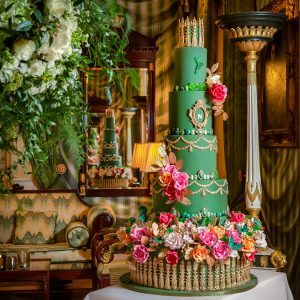 The cake was designed to reflect our client’s love for the colour green, gold and everything regal. This 7 tiered green marble cake had sugar jewels including a hummingbird and sugar flowers, and a monogram of her initial. She was absolutely delighted with her cake and could not get over how incredible it looked and tasted. It was an absolute honour to be the first luxury wedding cake maker to be invited to demonstrate at the largest food fair in Africa alongside food gurus such Lorraine Pascale and Ed Kimber. The hospitality was incredible and the thirst for knowledge inspiring. The bank’s holistic approach to empowering local communities is one to emulate. The first ever Bridelux symposium was held in London and was a resounding success for the founder James Lord and his team. It was an honour to be part of a line up that included Johhny Roxburgh, Colin Cowie, Ceci Johnson, Banana Split and many others. Our panel included celebrity florist Rob Van Helden who did the most divine flowers autumnal flowers for Princess Eugenie’s royal wedding. A pinch me moment was filming my segment for the first season of the BBC’s Best Christmas Food Ever presented by Paul Ainsworth and Catherine Fulvio. I was asked to create the best luxury Christmas cake table I could think of in classic Christmas colours. It was lots of fun and the crew were absolutely amazing. If anyone is interested, the programme is available on BBC iplayer and You Tube. Search for Season 1 Episode 4 and somewhere in the middle of the programme is my segment. We were again invited back as a judge at the annual Italian Wedding Awards. Anyone who knows us knows of our love for Italy and this time, the awards were held in Venice! Although we had seen photos and paintings of the canals of Venice but didn’t realise that water is literarily everywhere and we mean everywhere. Taking our first ever water taxi from the airport was indescribable. After a while, we all got used to traveling within the city that way. We stayed at the Hotel Danieli, the first ever luxury hotel in the city and we can confirm that it really does have the best roof top views and food. Huge congratulations to the organisers and award winners. We look forward to seeing you all again later this year. 2018 was an incredible year for collaborations at Elizabeth’s Cake Emporium. We absolutely love a great styled shoot. Give us an idea or a concept and watch us run with it. The year before we stopped giving our ideas away. Last year we really stepped up and explored some very cool concepts. This resulted in a number of shoots and one that went completely viral. We were absolutely over the moon when we were asked to style a promotional shoot for world renowned Bruce Oldfield by The Lanesborough to celebrate their joint new bridal offering. The very talented WildAbout provided the amazing florals and San of Sanshine Photography worked her magic behind the lens. Billed as the best set of images on Instagram, this shoot was based on Frida Kahlo’s most famous painting, Las Dos Fridas – The Two Fridas. The shoot was about celebrating the duality of a feminine feminist icon and it coincided with the first showing of her personal effects outside of Mexico at the Victoria and Albert museum. The incredible dresses which provided the inspiration for the shoot were designed by the very talented Joanne Fleming who is one of the most talented individuals I know. Leanne of WildAbout and her team designed the most beautiful floral canopy which left everyone in awe. Special thanks goes to the wonderful Roberta Facchini Photography who captured all the beauty. It was a joy to direct this shoot and work with a great team of immensely talented suppliers. The shoot was featured in so many blogs and magazines including Vogue, Rock My Wedding, Strictly Weddings and 100 Layer Cake and also in the annual 2019 International Trend Report. We are so glad that we held on to the vision, concept and story line, overcoming many obstacles to make sure we executed it to perfection. We were asked by renowned chocolate and cake guru Daniel Dieguz to collaborate with him on an epic installation at the Cake International show in Birmingham. 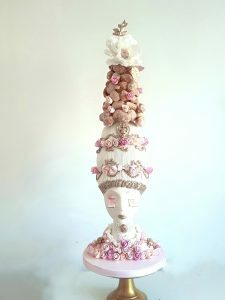 We created a fantasy head and bust cake, Madmoiselle Opulencia, the mistress of all things patisserie. It was quite a challenging piece and a bit of a departure from our usual luxury wedding cakes but we did make sure she was all pastries and glamour. For those in the know, Cake Masters awards are the Oscars of the cake industry and very highly coveted. 2018 saw around 200,000 nominations! For the first time in the UK, Cake Masters recognised the top ten cake designers in the UK and we made the list. Now considering that there are literarily thousands of very talented cake makers out there, to be acknowledged means a great deal. Thank you Cake Masters! Our adventures took us to a number of continents, countries and over 30 cities including Paris, Bahamas, Ibiza, Venice, Lisbon, Madrid, Berlin, Amsterdam, Africa and the Middle East. We don’t know what 2019 holds but early indications suggest another exciting, prosperous and wonderful year ahead in our world of luxury wedding and celebration cakes. Best of blessings to all and watch this space!